Intel's 28-core CPU demo has been getting a lot of flack from the press, highlighting how the company omitted important details from their product showcase, leaving those who less well acquainted with PC hardware surprised and confused by Intel's insane performance numbers. In recent interviews, Intel PR representatives have confirmed that "in the excitement of the moment" that Intel's Gregory Bryant "forgot" to mention that their demo system was overclocked, a detail which was present on the company's teleprompter for the event. This detail is a convenient omission, one which completely changes how Intel's demo was presented to those at the conference, though it is not a change outside of the realm of possibility. At the start of their demo, Intel stated that "Without further ado, I would like to present to you a new 28-core processor" and later in the demo, Bryant discussed the possibilities of a processor that offered the benefits of both high single-threaded performance and multi-threaded performance. What's never mentioned in the demo is that the system was heavily overclocked and that the system required an industrial-grade water cooler to operate. Tom's Hardware has reported that they were unable to get a private demo of Intel's insane 28-cores at 5GHz demo because the area where the system was located "simply didn't have enough dedicated circuits for the task", confirming that the system guzzled an insane amount of power. Tom's Hardware has also been able to nail down some other details about Intel's new processor, something that has been suspected but so far unverified. Intel confirmed that their 28-core was a 14nm product that will target professional workstations and hasn't decided what product series it will fall into. Intel's product demo was accompanied by an image which showcased the words "28 core", and a gamer wearing a headset and was presented inside a system with a Gigabyte Aorus-branded prototype motherboard and RGB Aorus memory, things that don't scream "professional workstation" to anyone. The best explanation for Intel's demo was that they wanted to steal the thunder from AMD's Threadripper 2 reveal, as at the time most onlookers were expecting AMD to reveal a 24-core processor as their new flagship, not a 32-core CPU. Intel focused on their highest-core count CPU at clock speeds that are higher than what Ryzen 2nd Generation processors can achieve, rather than focus on revealing a consumer-oriented product with a defined user base and a realistic cooling setup. The contrast here is that AMD presented their 32-core and 24-core CPU demos on air cooling using understood professional workloads, whereas Intel delivered a single benchmark result with a system that was so heavily overclocked that it required an industrial strength water cooler. You can join the discussion on Intel's admission that their 28-core product demo was overclocked on the OC3D Forums. It's honestly like April Fool's day in bloody June. Intel's hasn't explained anything about their 28-core CPU well. They "forgot" to mention that the system was overclocked and that the PC required an industrial liquid cooler to function. 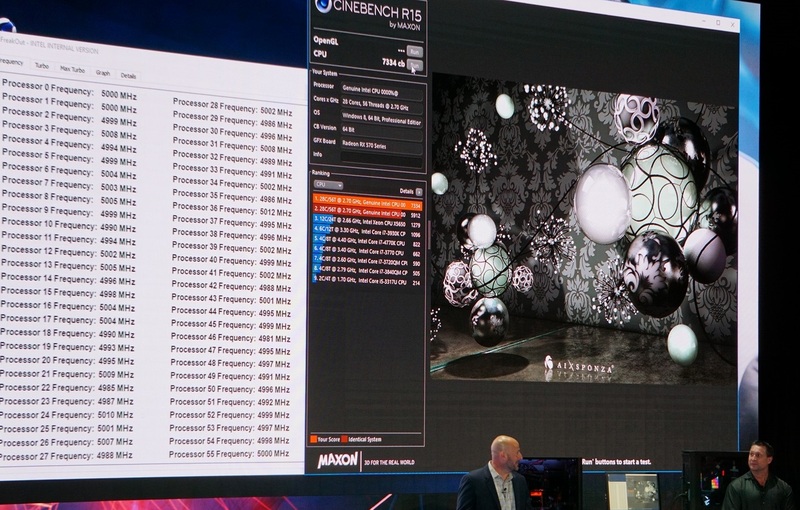 Read more about Intel admission that their 28-core CPU demo was overclocked. I don't see the big deal, we all knew the CPU would be overclocked and you need water to do it justice. If you even stopped for one second to think about the logistics? it's close to impossible. I don't mean you with that, Mark, but you would need a 360 rad just to cool the CPU. I would use a lot more than that just to be safe. My 7980XE uses 3 x 480mm rads because that was what happened to be in the system I used, having said that the CPU does run quite cool when oced. The point with this 28 core intel CPU is it will have special requirements but that won't bother anyone who wants to buy one. I read somewhere that the water cooling unit consumes over 1000 watts and the mobo had a 1300 watt PSU. 2300 watts! Imagine adding an SLI setup on top of that! This was all a "Hey look we not falling behind cos we have this unworkable concept"
Thing is this thing required a chiller to reach sub ambient temps to be able to overclock, That's not looking good IMO. Yup it will guzzle leccy. Plus it will also generate a ton of heat because in principle it is the same as a AC unit. And those things get hot as heck on one side. It was really daft of Intel to do this. It literally took even the slowest of reporters about two hours to realise that Intel had pulled the wool over their eyes.